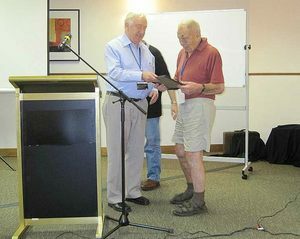 The WIA Annual Merit Awards were announced and presented at the Annual Conference in Darwin on the weekend of 28/29 May 2011. The G A Taylor medal was presented via a voice link to Jim Linton VK3PC, for his contribution to amateur radio over many years and in particular for his contribution as a member of the WIA Centenary Committee in providing professional guidance in respect of the promotion of amateur radio to the media. The Chris Jones Award was presented to the recently retired WIA Secretary Geoff Atkinson VK3AFA, and the Ron Wilkinson Award was presented to Phil Harman VK6APH for his contribution to amateur radio by his work in relation to digital techniques generally and the contribution of articles to amateur radio literature. The Higginbotham Award for contribution to amateur radio generally was presented to Jack Bramham VK3WWW for his work over many years including his ongoing contribution as the WIA ARDF Coordinator. The Al Shawsmith Award for Journalism was presented to David Smith VK3HZ for coordinating the ‘VHF/UHF – An Expanding World’ column in Amateur Radio and in particular for his reporting of weak signal communications. The Amateur Radio Technical Award was presented to Paul McMahon VK3DIP for his technical contributions to Amateur Radio, and in particular his two part article ‘A generic interface for the amateur experimenter’ published in the September/October, 2011 editions. A number of President’s Commendations were announced, including Paul Hoffmann VK5PH for his contribution to amateur radio generally and in particular for his work in relation to the establishment of the WIA National Field Day in 2010. President’s Commendations were also announced for Mike Patterson VK4MIK for his work in relation to the promotion of amateur radio in Far North Queensland over many years and John Bishop VK2BK for his contribution to amateur radio generally and in particular for his work in relation to the representation of the WIA on Standards Committees. Two members of the Darwin Amateur Radio Club were recognised. They were Terry Hine VK8TA and Frank Turnham VK8FT for their contribution to the club over very many years. Eric Van De Weyer VK2VE accepted President’s Commendations for himself and on behalf of the Facilitators of the Radio and Electronics School, which provides a unique and vital service in teaching those who wish to qualify as radio amateurs. The School’s Facilitators so honoured were Adam Jaroszuk VK4IM, Bryn Taylor VK4BRT, Peter Andjelkovic VK3KP, Tony Bedelph VK7AX, Lou Blasco VK3ALB, Ron Hayman VK4RH, Raff Lerro VK4KQ, Rusty McGrath VK4JM, Tim Roberts VK4YEH, Peter Rumble VK4KX, Mick Todd VK6JMA, Matthew Weatherley VK4TMW, Michael Wright VK5ARD, George Glendinning VK4AJL, Reg Emmett VK7KK, Ben Short VK7BEN, Jeff Creed VK4SE and Gail Lidden-Sandford VK4ION.